When you own a deli, the lineup of sandwiches is definitely one of the most important elements of your establishment. However, a sandwich alone does not constitute a fully balanced meal. For that, you'll need to add a list of delicious side items that will suit customer preferences and tastes. These four classic side items are guaranteed crowd pleasers, and your deli will thrive when these sides are on the menu. For customers who are looking for a healthy alternative to fatty and salty side items, a classic green salad is a great choice. These salads are incredibly easy to prepare, and the ingredients necessary to create a delicious green salad are very inexpensive. You can purchase many of the ingredients in large bulk shipments, which will further cut back on the expense of this side item. The most important component of a quality green salad is the greens that are used as the salad base. A mix of leafy greens such as romaine lettuce, baby spinach, arugula, and other herbs is a perfect start to a high quality green salad. If you are looking to cut costs, you can simply use pieces of dark green romaine lettuce or shredded iceberg lettuce. Dress the salad with chopped vegetables such as onion, carrots, celery and green bell pepper. Topping the salad with shredded cheese, croutons, and salad dressing finishes out this delicious side item. Potato salad is a classic side item that is often featured at a deli. Potato salad is part of the wet salad family, and many customers choose this side item because the cool, creamy mix is a perfect complement to a hot and toasted sandwich. To make excellent potato salad, it's important to start with high quality baked potatoes. The skin is removed from the baked potato, and the potato is diced into one inch cubes. To these cubed potatoes, mayonnaise and mustard are often added. Other mix-ins such as dill pickles, onion, and boiled eggs are also added to potato salad. You can experiment with different types of potato, different spices, and different added ingredients to create your own unique potato salad spin. If indulgence is what your customers are looking for, pairing deli sandwiches with hot and crispy French fries or kettle cooked potato chips is the easiest way to satisfy their cravings. Many delis have house potato chips, which are thinly sliced Idaho potatoes that have been kettle cooked in boiling oil. 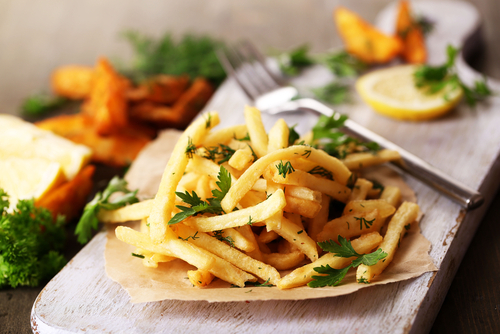 French fries can be crinkle cut, thick cut, thinly cut, or even curly cut and seasoned with a mix of tasty seasonings. Offering an assortment of fruit is a great way to satisfy health-conscious consumers who are interested in getting their daily dose of essential vitamins and minerals. You can purchase bulk fruit cocktail, which consists of fruit pieces marinated in syrup. For a more gourmet approach to this side item, you can slice fresh fruit, add berries, and toss the mixed fruit with sugar or raw honey.